Some things are just inherently strange. We may never be able to wrap our minds around Blac Chyna becoming a rapper but it looks to be happening. The former stripper and current entertainer has teased a move into music for some time, working in the studio with Joe Budden last year. Earlier in 2018, Ski Mask the Slump God teased a potential collaboration with Blac Chyna and while it didn't seem to have ever materialized, Chyna may have some tricks up her sleeve for an upcoming album or mixtape. Whether anybody would actually listen to the tape is yet to be determined but it definitely looks like Chyna is serious about starting a music career. She's been in plenty of videos but since previewing a new song in November of last year, she doesn't seem to have picked up the mic. Hitting her Instagram story, Chyna posted a video of her in the studio, rocking headphones and leaning into the microphone. 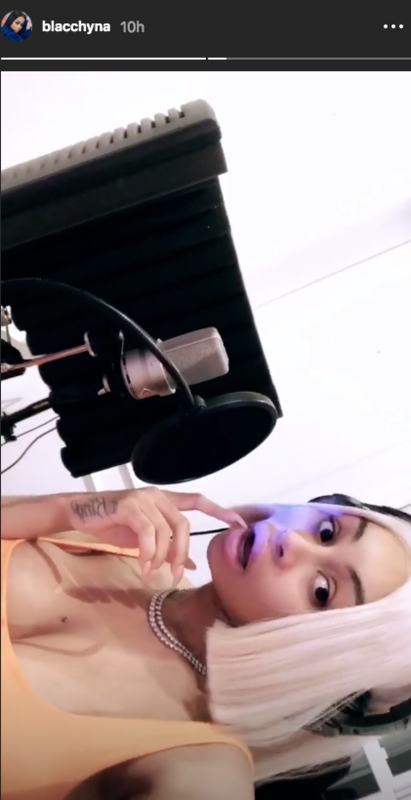 Perhaps she's laying down some background vocals for the next YBN Almighty Jay single? If not, she's definitely working on her own music. Who knows? Maybe Chyna is rap's savior and we're all blind to it. Realistically though, whatever she releases is bound to get views whether it's good or absolutely atrocious. Does anybody actually want this to happen, though?